FT with Girod turret at Royal Museum of the Armed Forces, Belgium. sliding gear; four speeds reverse, one forward. One main clutch plus two subsidiary clutches (one for each of the two tracks) used for steering the tank. The Renault FT, frequently referred to in post-World War I literature as the "FT-17" or "FT17", was a French light tank that was among the most revolutionary and influential tank designs in history. The FT was the first production tank to have its armament within a fully rotating turret. 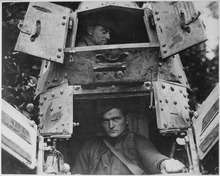 [note 1] The Renault FT's configuration – crew compartment at the front, engine compartment at the back, and main armament in a revolving turret – became and remains the standard tank layout. As such, historians of armoured warfare have called the Renault FT the world's first modern tank. Over 3,000 Renault FT tanks were manufactured by French industry, most of them during the year 1918. Another 950 of an almost identical licensed copy of the FT (the M1917) were made in the United States, but not in time to enter combat. The FT was designed and produced by the Société des Automobiles Renault (Renault Automobile Company), one of France's major manufacturers of motor vehicles then and now. It is thought possible that Louis Renault began working on the idea as early as 21 December 1915, after a visit from Colonel J.B.E. Estienne. Estienne had drawn up plans for a tracked armoured vehicle based on the Holt caterpillar tractor, and, with permission from General Joffre, approached Renault as a possible manufacturer. Renault declined, saying that his company was operating at full capacity producing war materiel and that he had no experience of tracked vehicles. 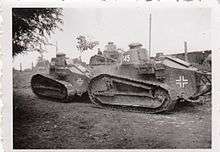 Estienne took his plans to the Schneider company, where they became France's first operational tank, the Schneider CA. At a later, chance meeting with Renault on 16 July 1916, Estienne asked him to reconsider, which he did. The speed with which the project then progressed to the mock-up stage has led to the theory that Renault had been working on the idea for some time. Louis Renault himself conceived the new tank's overall design and set its basic specifications. He imposed a realistic limit to the FT's projected weight, which could not exceed 7 tons. Louis Renault was unconvinced that a sufficient power-to-weight ratio could be achieved with the production engines available at the time to give sufficient mobility to the heavy tank types requested by the military. Renault's most talented industrial designer, Rodolphe Ernst-Metzmaier, generated the FT's detailed execution plans. Charles-Edmond Serre, a long time associate of Louis Renault, organized and supervised the new tank's mass production. The FT's tracks were kept automatically under tension to prevent derailments, while a rounded tail piece facilitated the crossing of trenches. Because the engine had been designed to function normally under any slant, very steep slopes could be negotiated by the Renault FT without loss of power. Effective internal ventilation was provided by the engine's radiator fan, which drew its air through the front crew compartment of the tank and forced it out through the rear engine's compartment. Renault's design was technically far more advanced than the other two French tanks at the time, namely the Schneider CA1 (1916) and the heavy Saint-Chamond (1917). Nevertheless, Renault encountered some early difficulties in getting his proposal fully supported by the head of the French tank arm, Colonel (later General) Jean Baptiste Eugène Estienne. After the first British use of heavy tanks on 15 September 1916 during the Battle of the Somme, the French military still pondered whether a large number of light tanks would be preferable to a smaller number of superheavy tanks (the later Char 2C). However, on 27 November 1916, Estienne had sent to the French Commander in Chief a personal memorandum proposing the immediate adoption and mass manufacture of a light tank based on the specifications of the Renault prototype. After receiving two large government orders for the FT tank, one in April 1917 and the other in June 1917, Renault was at last able to proceed. However, his design remained in competition with the superheavy Char 2C until the end of the war. The prototype was refined during the second half of 1917, but the Renault FT remained plagued by radiator fan belt problems throughout the war. Only 84 were produced in 1917, but 2,697 were delivered to the French army before the Armistice. About half of all FTs were manufactured in Renault's factory at Boulogne-Billancourt near Paris, with the remainder subcontracted to other concerns. Of the original order for 3,530, Renault accounted for 1,850 (52 per cent), Berliet 800 (23 per cent), SOMUA (a subsidiary of Schneider & Cie) 600 (17 per cent), and Delaunay-Belleville 280 (8 per cent). When the order was increased to 7,820 in 1918, production was distributed in roughly the same proportion. Louis Renault agreed to waive royalties for all French manufacturers of the FT. Attempts to manufacture in U.S. When the U.S. entered the war in April 1917, its army was short of heavy materiel, and had no tanks at all. Because of the wartime demands on French industry, it was decided that the quickest way to supply the American forces with sufficient armour was to manufacture the FT in the U.S. A requirement of 4,400 of a modified version, the M1917, was decided on, with delivery expected to begin in April, 1918. By June 1918, U.S. manufacturers had failed to produce any, and delivery dates were put back until September. France therefore agreed to lend 144 FTs, enough to equip two battalions. No M1917s reached the American Expeditionary Forces (AEF) until the war was over. US Army operating FTs on the Western Front, 1918. The first turret designed for the FT was a circular, cast steel version almost identical to that of the prototype. It was designed to carry a Hotchkiss 8mm machine gun. In April 1917 Estienne decided for tactical reasons that some vehicles should be capable of carrying a small cannon. The 37mm Puteaux gun was chosen, and attempts were made to produce a cast steel turret capable of accommodating it, but they were unsuccessful. The first 150 FTs were for training only, and made of non-hardened steel plus the first model of turret. Meanwhile, the Berliet Company had produced a new design, a polygonal turret of riveted plate, which was simpler to produce than the early cast steel turret. It was given the name "omnibus", since it could easily be adapted to mount either the Hotchkiss machine gun or the Puteaux 37mm with its telescopic sight. This turret was fitted to production models in large numbers. In 1918 Forges et aciéries Paul Girod produced a successful circular turret which was mostly cast with some rolled parts. The Girod turret was also an "omnibus" design. Girod supplied it to all the companies producing the FT, and in the later stages of the war it became more commonplace than the Berliet turret. The turret sat on a circular ball-bearing race, and could easily be rotated by the gunner/commander or be locked in position with a handbrake. The Renault FT was widely used by French forces in 1918 and by the American Expeditionary Force (AEF) on the Western Front in the later stages of World War I. The battlefield debut of the Renault FT occurred on 31 May 1918 east of the Forest of Retz, east of Chaudun, between Ploisy and Chazelles, during the Second Battle of the Marne. This engagement, with 30 FTs, successfully broke up a German advance, but in the absence of infantry support, the vehicles later withdrew. From then on, gradually increasing numbers of FTs were deployed, together with smaller numbers of the older Schneider CA1 and Saint-Chamond tanks. As the war had become a war of movement during the summer of 1918, during the Hundred Days Offensive, the lighter FTs were often transported on heavy trucks and special trailers rather than by rail on flat cars. Estienne had initially proposed to overwhelm the enemy defences using a "swarm" of light tanks, a tactic that was eventually successfully implemented. Beginning in late 1917, the Entente allies were attempting to outproduce the Central Powers in all respects, including artillery, tanks, and chemical weapons. Consequently a goal was set of manufacturing 12,260 Renault FT tanks (including 4,440 of the American version) before the end of 1919. After the end of World War I, Renault FTs were exported to many countries (Belgium, Brazil, Czechoslovakia, Estonia, Finland, Iran, Japan, Lithuania, Netherlands, Poland, Romania, Spain, Switzerland, Turkey, and Yugoslavia). Renault FT tanks were used by most nations having armoured forces, generally as their prominent tank type. The tanks were used in many later conflicts, such as the Russian Civil War, Polish-Soviet War, Chinese Civil War, Rif War, Spanish Civil War, and Estonian War of Independence. On 5 February 1920 Estonia purchased nine vehicles from France. Renault FT tanks were also fielded in limited numbers during World War II, in Poland, Finland, France, and the Kingdom of Yugoslavia, although they were already obsolete. In 1940, the French Army still had eight battalions, each equipped with 63 FTs, as well as three independent companies, each with 10, for a total organic strength of 534, all equipped with machine guns. These were put to use after most of the modern equipment was lost in earlier battles. Many smaller units assembled after the start of World War II also used the Renault FT. This usage gave rise to the popular myth that the French had no modern equipment at all; in fact, they had more modern tanks than the Germans. The French suffered from tactical and strategic weaknesses rather than from equipment deficiencies. When the best French units were cut off by the German drive to the English Channel, the complete French materiel reserve was sent to the front as an expediency measure; this included 575 FTs. Earlier, 115 sections of FTs had been formed for airbase defence. The Wehrmacht captured 1,704 FTs. They used about 100 for airfield defence and about 650 for patrolling occupied Europe. Captured FT tanks in German service in Serbia (World War II). Some were used by the Germans in 1944 for street-fighting in Paris, but by this time they were hopelessly out of date. 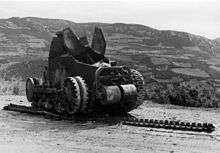 Vichy France used Renault FTs against Allied invasion forces during Operation Torch in Morocco and Algeria. The French tanks, however, were no match for the newly arrived American M4 Sherman and M3 Stuart tanks. 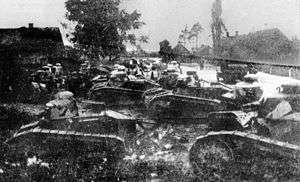 Polish FT tanks during the Battle of Dyneburg. The FT was the ancestor of a long line of French tanks: the FT Kégresse, the NC1, the NC2, the Char D1, and the Char D2. The Italians produced the FIAT 3000, a moderately close copy of the FT, as their standard tank. The Soviet Red Army captured 14 burnt-out Renaults from White Russian forces and rebuilt them at the Krasnoye Sormovo Factory in 1920. Nearly 15 exact copies, called "Russki Renoe", were produced in 1920–1922, but they never used in battle because of many technical problems. 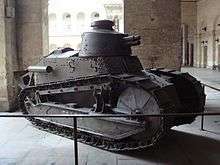 In 1928–1931, the first completely Soviet-designed tank was the T-18, a derivative of the Renault with sprung suspension. 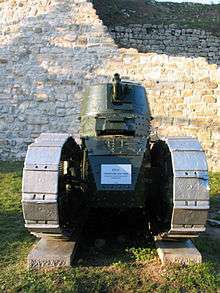 In all, the Renault FT was used by Afghanistan, Belgium, Brazil, the Republic of China, Czechoslovakia, Estonia, Finland, France, Nazi Germany, Iran, Japan, Lithuania, the Netherlands, Philippine Commonwealth, Poland, Romania, the Russian White movement, the Soviet Union, Spain, Sweden, Switzerland, Turkey, the United Kingdom, the United States and the Kingdom of Yugoslavia. FT at Belgrade Military Museum, Serbia. Much confusion surrounds the name of this tank. It is sometimes stated that the letters FT stand for the French terms faible tonnage (low tonnage), faible taille (small size), franchisseur de tranchées (trench crosser), or force terrestre (land force). None is correct. Nor was it named the FT 17 or FT-17; nor was there an FT18. All new Renault projects were given a two-letter product code for internal use, and the next one available was 'FT'. The prototype was at first referred to as the automitrailleuse à chenilles Renault FT modèle 1917. Automitrailleuse à chenilles means "armoured car [lit: motorized machine gun] with tracks." By this stage of the War, automitrailleuse was the standard word for an armoured car, but by the time the FT was designed there were two other types of French tank in existence and the term char d'assaut (from the French char - a cart or wagon, and assaut; attack or assault), soon shortened to char, had at the insistence of Colonel Estienne, already been adopted by the French and was in common use. Once orders for the vehicle had been secured it was the practice at Renault to refer to it as the "FT". The vehicle was originally intended to carry a machine-gun, and was therefore described as a char mitrailleur - mitrailleur (from mitraille; grapeshot) had by this time come to mean "machine-gunner". Many sources, predominantly English language accounts, refer to the FT as the "FT 17" or "FT-17." This term is not contemporary, and appears to have arisen post World War One. In Estienne's biography, his granddaughter states, "It is also referred to as the FT 17: the number 17 was added after the war in history books, since it was always referred to at Renault as the FT." Lieutenant-Colonel Paul Malmassari (French tank officer and Doctor of History) states, "The Renault tank never carried the name FT 17 during the First World War, although the initials F.T. seem to appear in August 1917." Some confusion might also have been caused by the fact that the American version of the vehicle, produced in the USA under licence from Renault, was designated the M1917. When it was decided to equip the FTs with either cannon or machine-guns, the cannon version was designated char canon (cannon tank) and the latter, in accordance with French grammar, renamed char mitrailleuse (machine-gun tank). It is frequently claimed that some of these tanks were designated FT 18. Reasons given for the claim include: it distinguished tanks produced in 1918 from those of 1917; it was applied to FTs armed with cannon as opposed to those with machine-guns; it distinguished FTs with a cast, rounded turret from those with a hexagonal one; it referred to the 18 horsepower engine; it indicated a version to which various modifications had been made. However, Renault records make no distinction between 1917 and 1918 output; the decision to arm FTs with a 37mm gun was made in April 1917, before any tanks had been manufactured; because of various production difficulties and design requirements, a range of turret types were produced by several manufacturers, but they were all fitted to the basic FT body without any distinguishing reference; all FTs had the same model 18 hp engine. The Renault manual of April 1918 is entitled RENAULT CHAR D'ASSAUT 18 HP, and the illustrations are of the machine-gun version. The official designation was not changed until the 1930s, when the FT was fitted with a Model 1931 machine-gun and renamed the FT31. By this time, the French Army was equipped with several other Renault models and it had become necessary to distinguish between the various types. 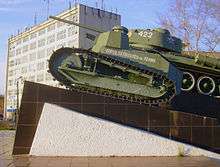 Monument to first Soviet tank in Nizhny Novgorod, a copy of "Russkiy Reno"
Renault FT AC: A plan to convert France's obsolete FTs in to Tank Destroyers. The tank never left the drawing board. It was designed to have a Canon de 25mm Anti-Tank gun. Musée des Blindés, Saumur, France. The museum owns three FTs, with two in running order. The inoperable one came from Afghanistan, and is in a static display. Two other tanks from Afghanistan were given to the Patton Museum of Cavalry & Armor at Fort Knox, Kentucky. Another one was given to Poland, where it has been renovated and is in running order. The Musée des Blindés also owns an FT TSF; it currently has no tracks and driving train, but the museum intends to restore it. Bovington Tank Museum, United Kingdom. One FT, an unarmoured training model. The Weald Foundation, U.K., has an FT and a TSF, both undergoing restoration. Royal Military Museum, Belgium. One FT is on permanent display. National Military Museum (Romania), Bucharest, Romania. An FT is on permanent outdoor display. Military Museum (Belgrade), Belgrade, Serbia. An FT is on permanent outdoor display. Parola Tank Museum, Parola, Finland. An FT is on display in the tank hall. Musée de l'armée Suisse, Burgdorf, Switzerland. An FT is displayed as the first tank of the Swiss Army, adopted in 1922. Museo de Medios Acorazados, El Goloso (Spain). An FT model 1917 under repair. Two full-scale, working replicas of Renault FTs were built from scratch by an enthusiast for Jerzy Hoffman's Battle of Warsaw 1920 2011 film. National Armor and Cavalry Museum, Fort Benning, Georgia in the United States. In 2003, two FT tanks, one would have mounted a 37mm cannon and the other a 8mm mg, were discovered in Kabul by Major Robert Redding. With permission from the Afghan government, the two tanks were transferred to the United States, where one of them, a machine gun tank, was restored and originally put on display in the Patton Museum of Cavalry & Armor, until the Armor Branch collection was transferred to Fort Benning. This FT is currently on display in the Armor Gallery of the NIM. The NACM currently is restoring the other FT, 37mm gun tank. A previous FT at Fort Knox was transferred to U.S. Army Heritage & Education Center at Carlisle Barracks, PA.
Louisiana State Military Museum at Jackson Barracks in New Orleans, Louisiana. An FT was inundated by floodwaters of Hurricane Katrina in 2005. It is being restored and will be returned to display. National World War I Museum, located at Liberty Memorial, Kansas City, Missouri. An FT, damaged by German artillery. An FT is on static display at the U.S. Army Heritage and Education Center at Carlisle Barracks, Pennsylvania. An FT is displayed in a life-sized diorama at Fort George G. Meade Museum, Maryland. Museu Militar Conde de Linhares in Rio de Janeiro, Brazil. One FT.
↑ Although a rotating turret had been a feature of some earlier tank designs or prototypes, and had been incorporated in armoured cars for several years, no tank with a turret had entered service. ↑ "Fire and Ice, The Winter War of Finland and Russia". Wfyi.org. Retrieved 2011-02-04. ↑ Zaloga, Steven J (1988). The Renault FT Light Tank. London: Osprey. p. 3. ↑ Danjou, Pascal; Renault FT. Editions du Barbotin, 2009. p6. ↑ Jeudy, Jean-Gabriel; Chars de France. E.T.A.I., 1997 p36. ↑ Ibidem Zaloga, 2010, Chapter "The Light Tank Idea"
↑ Atkinson, Rick. An Army at Dawn: The War in North Africa, 1942–1943. ↑ Malmassari, P: Les chars de la Grande Guerre. Groupe Hommell, 2009. ↑ Jeudy, Jean-Gabriel; Chars de France. E.T.A.I., 1997. ↑ Zaloga, Steven J.; The Renault FT Light Tank. London, 1988. ↑ Danjou, Pascal; Renault FT. Editions du Barbotin, 2009. ↑ Ramspacher, Colonel E.G. ; Le général Estienne. Lavauzelle, 1983. ↑ Ernst-Metzmaier, Rodolphe. Quelques souvenirs. ↑ "Taki's Imperial Japanese Army". .plala.or.jp. Retrieved 2011-02-04. ↑ NW36 (12 March 2003). "Poland's FT17". Mailer.fsu.edu. Retrieved 2013-01-04. ↑ Staff Sgt. Bhatti / 11th Public Affairs Detachment. "Rare French Tank Being Taken to U.S.". DefendAmerica News. ↑ "Museum record entry". 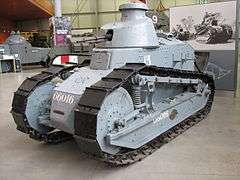 Tankmuseum.org. Retrieved 2011-02-04. ↑ "Royal Museum of the Army and of Military History, Brussels – Belgium". Klm-mra.be. Retrieved 2010-09-09. ↑ "Forum Eerste Wereldoorlog :: Bekijk onderwerp – French Tanks surviving the war". Forumeerstewereldoorlog.nl. Retrieved 2010-09-09. ↑ "Panssarimuseo - Pansarmuseet, Parola - The Armour Museum, Finland - Das Panzer Museum, Finland". Panssarimuseo.fi. Retrieved 2013-03-11. ↑ "Musée de l'armée Suisse". ↑ "Carro ligero Renault FT modelo 1917". Museo de Medios Acorazados El Goloso. Ministerio de Defensa. Retrieved 21 March 2014. ↑ Marcin Bosacki (2012-10-20). "Zabytkowy czołg trafi z Afganistanu do Polski". MSZ. ↑ "National World War I Museum – Permanent Exhibits". Theworldwar.org. Retrieved 2010-09-09. ↑ Bastos, Carlos Stephani. "Renault FT-17 In Brazilian Army 1921 – 1942" (PDF). Federal University of Juiz de Fora. Retrieved 13 July 2015. 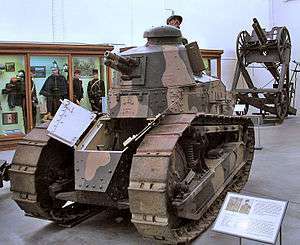 Currently there are six Renault FT-17 preserved in the country, five are held by the Army 8 and one is a private museum. Of these, five are from the armed version with 37mm Puteaux cannon and tower Berliet. One Renault owns a hexagonal tower and 7mm Hotchkiss machine gun. Between 2009 and 2011, one Renault FT-17 with Berliet turret and armed with 37mm Puteaux cannon has been fully restored and is in full operation, with original engine and participates in military parades on special dates. ↑ "Renault FT-17 Light Tank". Australian War Memorial. Retrieved 13 July 2015. The French Renault FT-17 tank was the most successful tank design to emerge from the First World War. It is widely regarded as the first tank to display modern tank qualities such as a fully rotating, 360 degree turret, a commanders cupola, a separate engine compartment to the crew compartment and the capability of fitting larger weapons and a future wireless set. It had very good cross country and vertical climbing performance. This FT-17 tank saw action on the Western front in 1918 and suffered some minor battle damage. At the end of the First World War it was transported to Australia as a thankyou[sic] gift from a grateful French Government. Zaloga, Steven J., (2010) "French Tanks of World War 1", Osprey Publishing Ltd, London, ISBN 978-1-84603-513-5. Zaloga, Steven J., (1988) "The Renault FT Light Tank", Osprey Publishing Ltd, London, ISBN 0-85045-852-8 . Jurkiewiecz,Bruno, (2008) Les Chars Francais au Combat 1917–1918, (over 150 illustrations) ECPAD/YSEC, BP 405 27405 Louviers Cedex France. A compatible DVD of period films demonstrating the French WW I tanks, including the Renault FT, is attached to this book. Gougaud, Alain, (1987) L'Aube de la Gloire: Les auto mitrailleuses et les chars francais pendant la Grande Guerre, Histoire technique et militaire, Societe Ocebur (Guides Muller), ISBN 2-904255-02-8. Benedict Crowell, (1919) America's Munitions 1917-1918, Chapter 8 : Tanks, Washington Government Printing Office. Colonel J.Perre, (1940) Batailles et Combats des Chars Francais: La bataille defensive Avril-Juillet 1918. Second Tome. Charles Lavauzelle & Cie.
Wikimedia Commons has media related to Renault FT-17.